This is an overview of a basic shamanic journey guided by drumming. In this article, I run through what a journey looks like while giving you tips on how to deepen the journey experience. If you’d like more guidance, you may want to take our Shamanism 101 course. Preparation is essential for a shamanic journey. The first important tip is to eat lightly or not at all for a few hours before you start a shamanic journey. You can journey on a full stomach, however, eating lightly generally sets you up for a better experience. Explore different diets to see what is more conducive to a more in-depth experience. Refrain from alcohol, tobacco, and other substances for twenty-four hours before a shamanic journey. Depending on the individual, certain substances, medications, and drugs can inhibit journeying altogether. Physical activity or meditation can be wonderful preparation for a shamanic journey. A practice, such as yoga or movement meditation, shifts our attention into the body, focusing the mind and opening the heart. Your favorite light visualization is good to do right before a journey – visualize yourself filling with light, breathing in light and breathing out the light. The ten-minute audio recording called Rattle, Body and Light Meditation is a good starting place. Give your surroundings some attention. Possibly turn off the lights, draw the shades and turn off the phone/Wi-Fi. You may have a journeying blanket or items from nature that you like to have around you while you journey. It’s common to have preferred times of the day for a shamanic journey so notice what works best for you. I typically journey first thing in the morning, right before lunch or dinner or later at night. Place your body in a relaxed position that can be sustained for ten to fifteen minutes. Lying down is common although this is not the traditional way of journeying. Journeying can be done in a seated position as well as standing and dancing. To start, I recommend a relaxed and slightly reclined seated position. Whatever position you choose, keep your body actively relaxed (not falling asleep) with the arms and legs uncrossed (hands and feet not touching). Usually, it’s helpful to have a clear intention for the mind to focus on while journeying. Do you intend to journey to a specific place? Do you intend to journey to learn specific information or for a particular purpose such as relaxation? A good first intention is to journey to meet with a power animal. We’ve created an audio meditation to help you connect to a power animal as part of our membership. Also, consider the questions you may ask about your intention. Practice forming questions using how, where, when, why and what. Steer clear of yes/no questions or questions beginning with should. What will be helpful to know for my interview tomorrow? and Should I go to the interview tomorrow? will most likely elicit different answers. Forming questions is an art. The information we receive is directly related to the questions we ask. The clearer our questions, the increased potential there is to receive answers in service to our higher self. When you feel ready to begin, start some drumming intended for shamanic journeying. Shamanic drumming is relatively fast and steady at four to seven beats per second. You can drum for yourself, have someone drum for you or use a good recording. If you are learning to drum it helps to practice with others or use a CD to get the appropriate speed in your muscle memory. Typically, people drum and rattle slower when first starting out. I recommend the CD in the back of the book Awakening to the Spirit World by Sandra Ingerman and Hank Wesselman. It has four excellent journeying tracks. As you begin your shamanic journey, breathe into your heart space (chest area). Offer a prayer of protection for you and your loved ones, requesting power, protection and support. Find your own personalized way of initiating a journey over time. This establishes an intentional connection to your spirit helpers, helps dissipate any fear or tension and signals the start of the shamanic journey. Listening to the sound of the drums and rattles can help you start your shamanic journey. The drumming is our path into the spirit world. Follow the sounds and be curious. Focus the mind on your intention. When you close your eyes, notice any images or patterns on your inner screen. Allow yourself to passively receive visuals, sounds, smells, and feelings – any sensations that are available to you. If you don’t seem to be going anywhere, you can also utilize your active imagination to travel through a portal to the spirit world. A portal may be a favorite picture hanging on your wall, a dream scene or an altar. There is no wrong or right way and there are infinite possibilities. Find the way into the spirit world that you enjoy and that works for you. Arriving in the spirit world may take some time or it can happen very quickly. From the shamanic perspective, we are intentionally sending our consciousness into the spirit world. We do this for a variety of reasons – to connect, retrieve information, heal, restore and energize ourselves. We may have a clear doorway and path that we follow in or we may simply find ourselves in the spirit world. Typically, we arrive in the middle realm of the spirit world – a spiritual representation of our physical world. So, it may seem familiar. Often, we arrive into the spirit world in a place in nature. We may find ourselves at a beach or in a forest. Notice what is around you and get an idea of where you have arrived. This will most likely be a common starting place for you in the spirit world. If this is your first journey, take some time to be curious and explore. Notice any of the elements that appear – water, fire, air, wood (trees), metal and earth (rocks). Notice any other beings that appear – animals or people. Ask them if they are there to provide protection, power and support. If you feel an affirmative response, ask them a question and notice how you receive the answer. Stay open to the unexpected. It is common for us to think one thing is going to happen and for something or someone completely different to show up. Allow your shamanic journey to unfold, breathing into your heart space and focusing the mind on your intention. Continue to allow your attention to follow what it is drawn to and, at the same time, keep your awareness extended to the drumming. One distinction of a shamanic journey is that we are awake and aware of the physical world and the spirit world at the same time. Often, we receive information through the physical body so pay attention, be curious and follow what feels right. At first, you may question what you experience or doubt whether it is real. This is normal, however, don’t let it stop you. Everything that we can touch was once imagined. Not everything that is real can be seen with physical eyes. Over time, use your experience to test the results of your shamanic journey work. A shamanic journey can be five minutes or five days long in the physical world. 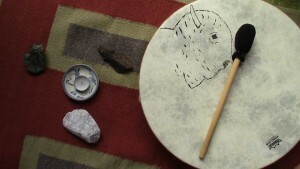 Usually, a modern shamanic journey to drumming is about ten to twenty minutes long. At the end of the shamanic journey the drumming shifts to a faster beat. When you hear this change in the drumming, find closure in the spirit world and give thanks to any spirits assisting you on your shamanic journey. Shift your attention to returning your consciousness fully to your physical body. Typically, it is good to retrace your steps in the spirit world back to your physical body. Similar to coming out of a dream, gently open your eyes and try to remember as many details of the shamanic journey as possible. Write down what you experienced and draw pictures from your journey. When we journey, a lot can happen in ten minutes. Writing and drawing your shamanic journey experience allows you to discover additional insights. When you translate your shamanic journey, include all that you experienced – smells, sounds, thoughts, feelings, colors, symbols, words (even if they are in a language you do not know), visualizations and communications. Include the details of where you were and who you were with. Was it day or night? Did you come across any water, fire, or animals? Avoid editing the experience. After a shamanic journey, depending on what you experienced and how you feel, you may want to take particular actions. For example, you may want to learn about an animal that came to you or a spirit teacher may have given you a specific task to carry out. You may have a word or symbol to research. Continue to notice how you feel throughout the day. Pay attention to any synchronicities that occur that week. Track your dreams. Keep a journal of your feelings, synchronicities, dreams and any actions you take. Shamanic journeying may have immediate results, and over time, you will most likely notice additional ways it is assisting you in your life.